COLLEGE PARK, Md. 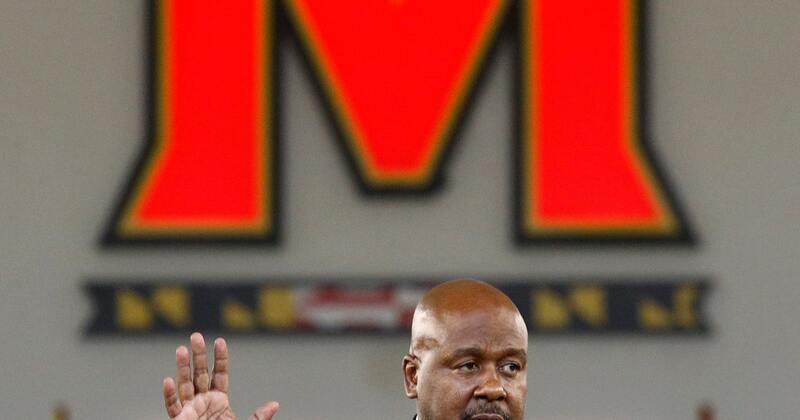 (AP) — Mike Locksley is thrilled to be home. The Washington native who spent two stints as a Maryland football assistant and also served as the Terrapins‘ interim leader for six games in 2015 was introduced Thursday as the school’s full-time coach. It has been less than six months since the June 13 death of offensive lineman Jordan McNair, who collapsed from heat stroke May 29 during an offseason workout. Former coach D.J. Durkin was placed on administrative leave on Aug. 11 as investigations were conducted into the circumstances surrounding McNair’s death and allegations of bullying and intimidation by coach and one of his assistants. Locksley also knows McNair’s family; his daughter attended high school with McNair. Martin McNair, Jordan’s father, attended Thursday’s news conference. “My No. 1 priority and focus will be the health, development and safety as the head of this family,” Locksley said. It is Locksley’s second full-time head coaching job. He had a rocky tenure on and off the field over parts of three seasons at New Mexico, where he was 2-26. He was suspended for one game in 2009 for an altercation with an assistant coach, and was sued for sexual harassment by an administrative assistant. Those claims were later resolved. Including his six-game stint as Maryland’s interim coach in 2015, he owns a 3-31 career record. Maryland’s football program has struggled to gain traction since joining the Big Ten in 2014. The Terps have gone 13-30 in league play in that span, including a combined 3-17 against East Division powers Michigan, Michigan State, Ohio State and Penn State. “We have one of the best areas in the country for talent, and we’re going to work our tails off to keep it right here,” Locksley said.